Save It, Donate It, Trash It: What Do You Do With "The Dress?" Your Wedding Dress: You fantasized about it since you were a little girl, searched through hundreds upon hundreds of inferior options until you found The Perfect One, and probably paid more for this single piece of clothing than you spent on your first car. But now that The Big Day has come and gone, what are you going to do with your beautiful (but now essentially useless) wear-it-once-in-a-lifetime gown? Follow these creative tips on how to continue enjoying your wedding dress long after your vows have been exchanged. Save It! Unwilling to part with such a sentimental garment, most brides hold onto their wedding dresses for years after their nuptials. Many women save their wedding dress for their daughter(s) to wear, and the idea of The Dress becoming a family heirloom is gaining popularity as younger brides are picking up retro style from past generation. Preserving your dress as a keepsake doesn’t mean it has to remain cryogenically frozen in storage or sealed in an air-tight garment bag in the back of your closet, however; trendy brides are choosing to relive their special day by wearing their bridal gowns for photo shoots on five- or ten-year anniversaries. One bride even hosted a “Wear Your Wedding Dress” party for all her married friends! Destroy It! 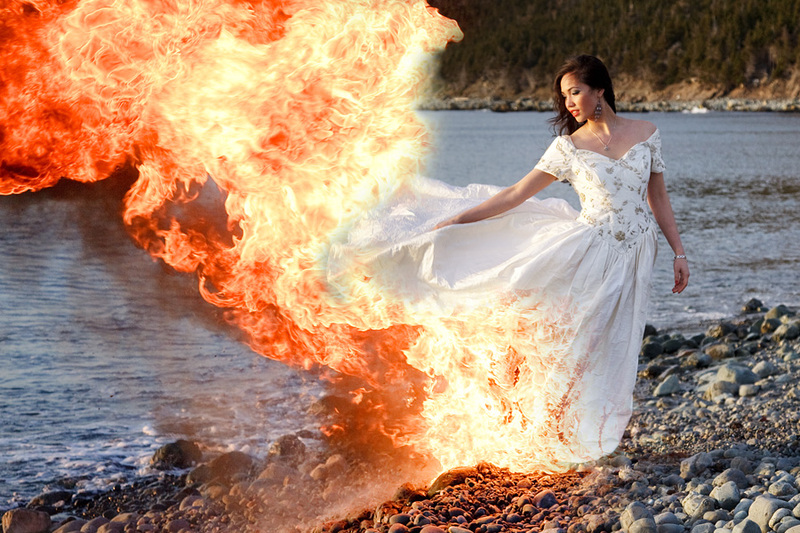 A recent trend in wedding photography calls for brides to “Trash The Dress” either immediately after the ceremony or as a theme for an anniversary photoshoot. These photos often depict the brides destroying their pristine dresses in water, on the beach, by covering them in mud or paint, and in some extreme cases, even by lighting them on fire. Some brides also recommend using the fabric from your gown to make something completely new, like a small purse that a daughter can carry on her wedding day – a perfect and sentimental “something old” – or a baby dress for the couple’s first-born.